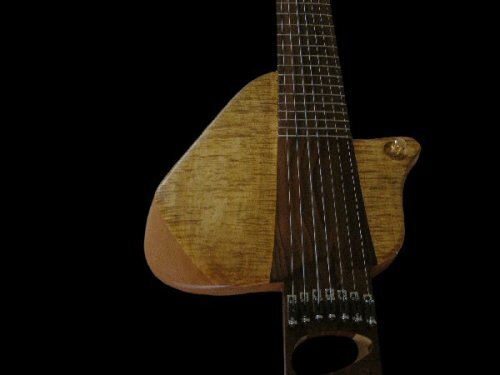 In this final installment, we look at the last of the progress pictures as the extended range bass guitar by Crimson Guitars comes to completion. You just can’t go out and buy a bridge for an instrument like this, so Ben at Crimson Guitars came up with a rather ingenious custom guitar bridge assembly. Note the L-shaped brackets that attach to the surface of the bridge area and act as anchor points for the bridge saddles. The arrangement is simple, elegant and effective. 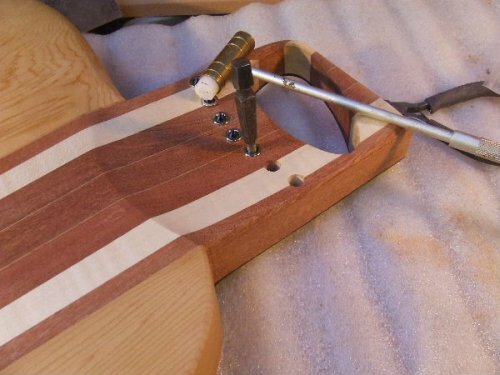 BTW, this custom guitar bridge has applications in conventional guitars as well. Think about the flexibility this provides. It can be built simply. You can make the spacing anything you want. 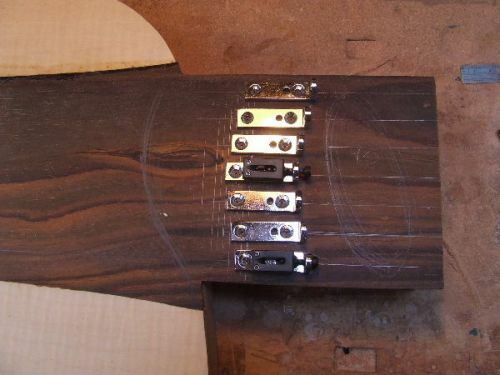 You can use bridge saddles with piezo pickups already built in for an acoustic like tone. Surface mounting eases installation. It can be built at low cost. But where are the pickups? They’re actually hidden underneath the top wood! Custom pickups were wound just for this purpose. For more, check out part 1 and part 2 as well as the initial coverage of the ERB. Many thanks to Ben at Crimson Guitars for generously providing BTEG with all of these progress pictures! What talent you have. I would give my left pinky toe to be able to build guitars the way you do. The pic above where you can’t see the pick ups is awesome. Ben at Crimson Guitars is clearly a talented guitar builder. 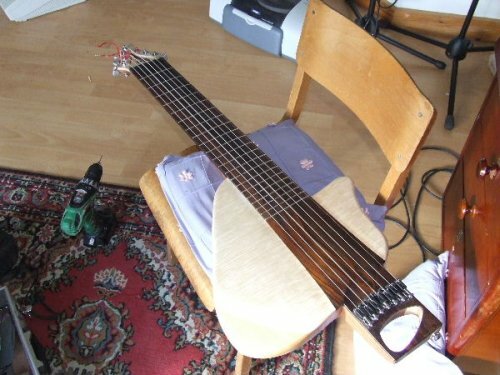 05Ric made a wise choice going to him to bring his vision of this instrument to life.